In 1986 my father, Les Meyer, and I planted 400 grapevines to make wine from the grapes we grew. Over the years we won numerous amateur winemaking awards, and in 1994 we established Holy-Field Vineyard & Winery. Ours was not the first Kansas winery, but it is the oldest operating winery in the state. Since we started entering professional wine competitions in 1999, we have earned more than 600 international wine awards. 2) What is your vineyard philosophy? The most important factor of a vineyard is the care it receives. My dad often says, “There is nothing a grapevine likes better than the caring shadow of its owner.” Holy-Field wines are made from Holy-Field grapes, and the quality of those grapes is obvious in every bottle of our award-winning wines. 3) What grapes do you grow? We grow French Hybrid grapes, including Seyval, Chardonel, Melody (all white) and St. Vincent, Baco Noir and Cynthiana (all red). 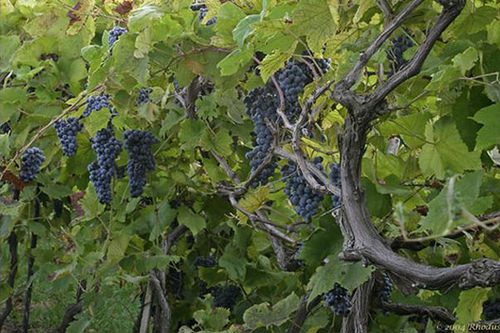 Our grapes are harvested by hand, usually from mid-August through late September or early October. 4) Tell us about your community grape-picking events. In 1994 Holy-Field Vineyard & Winery was the first in Kansas to establish the grape-picking experience we call “Picking Sundays,” held every Sunday of grape harvest. The event is free, and all volunteers are treated to a home-cooked farm lunch after the picking. Each guest also receives a complimentary Harvest Crew T-shirt, and there’s always some friendly competition about who has been picking Holy-Field grapes the longest. 5) Do you offer tours or special events? We offer tours by appointment and sometimes by chance. There’s a beautiful view of the vineyard from our wine deck, and guests are encouraged to take vineyard strolls. We believe in sharing the agriculture behind the wine and delight in sharing our vineyard with our guests. 6) Is your wine available for sale outside your winery? Although the majority of our wines are sold from our tasting room, our wines are available at a handful of local retailers in the Kansas City area (Kansas side).